James Sutherland writes a detailed tactical analysis of the Premier League match between Arsneal and Chelsea that ended in a win for the Blues. This is one of the most intense fixtures in the Premier League season. Although Jose Mourinho left Chelsea over a month ago, his figure loomed over this match. The rivalry between Arsene Wenger and Mourinho fueled the fire of this rivalry over the past three seasons, and this match was no different. Arsenal needed a win to stay on top of the table, fending off Leicester’s challenge. The Gunners also would have enjoyed greatly increasing Chelsea’s misery. The Blues sat in 14th, just above the relegation spots, and needed at least a point to stay on track. 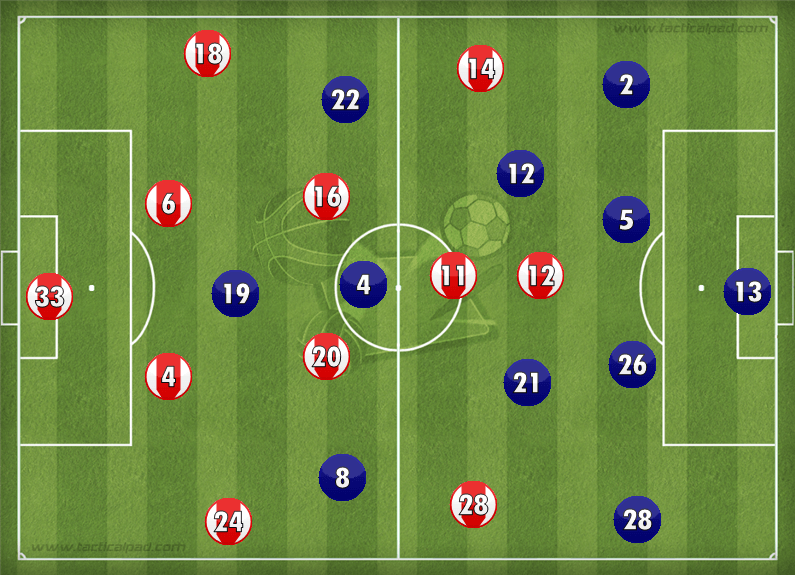 Both teams lined up in a 4-2-3-1, but each played a very different double pivot. Wenger was without a defensive midfielder, as Francis Coquelin is still injured and Mohamed Elneny had just arrived at the club. Arsenal lined up instead with Aaron Ramsey and Mathieu Flamini in front of the back four. This turned out to be a disastrous combination, as neither protected the central defenders. Guus Hiddink has, since taking over the team in late December, consistently chosen John Obi Mikel to play in the double pivot, alongside either Cesc Fabregas or Nemanja Matic. For the second straight game, though, Hiddink chose all three. Matic and Mikel played in the pivot, while Fabregas lined up (notice, lined up) further forward. Playing two fairly defensive minded midfielders helped shield Chelsea’s backline much better than this season has seen. Many teams have noticed the plight of Branislav Ivanovic this season. Chelsea’s stalwart right back was picked for the Premier League best XI last season, and played every minute of Chelsea’s Premier League campaign. He is one of the senior leaders of the team. But this season, he’s been found out. Ivanovic is truly a center back, converted to play right back. He has always lacked the pace and individual defensive skill to match the best wingers in the league, but teams have only this season begun to capitalize on his weaknesses. Wenger also tried to isolate and break down Ivanovic. Theo Walcott started on the left, and Mesut Ozil, Aaron Ramsey and Olivier Giroud would drift over as well. Arsenal looked to play quick one-twos, and overload Ivanovic, allowing Walcott to make runs on the wing and into the box. In the above video, Arsenal overload the left side, creating a 5 v 4. While Chelsea have it decently well contained, a few quick passing combinations has Walcott through behind Ivanovic. He cuts it back on the goal line, but Joel Campbell scuffs the shot. This focus on the left wasn’t limited to Ivanovic. On this corner, Mikel is on the left, and turns his back to Walcott. If Walcott had timed his run just a little better, he would have been through on goal. While Arsenal did create several chances from the left, most were either products of an offside player or never amounted to a shot. Furthermore, when Per Mertesacker was sent off, and Wenger took off Giroud to get Gabriel on in his place, Arsenal lost any variance. Walcott moved centrally, but rarely stayed there, often moving back to his original spot on the left wing. Aaron Ramsey, who had nominally moved into his spot, often dropped back into center midfield. Arsenal failed to score with this strategy for several reasons. Firstly, Mikel did a good job of covering Ivanovic. He sat in the right halfspace, making sure Ivanovic was never completely isolated. Kurt Zouma, the center back on that side, also helped cover for Ivanovic. Zouma was invaluable because his pace matches Walcott’s, and he was able to negate Walcott’s runs in behind. Willian tracked back on occasion, also helping to dilute Arsenal’s overloads. Secondly, Arsenal never challenged Chelsea’s center backs, Zouma and John Terry. The pairing has been Hiddink’s go to, but they have looked shaky in many games. Watford successfully isolated and attacked particularly Terry, scoring two goals, several weeks ago. But without a true center forward, or even a midfielder masquerading as one, the center backs were left completely unchallenged. This allowed Zouma to drift over and cover Ivanovic. It also meant that Arsenal lacked centrality and found it difficult to mount chances in open play after Mertesacker’s sending off. Arsene didn’t have another true striker on the bench to bring on, which brings up the question of whether bring off Giroud was the correct decision in the first place. He might have challenged Terry and Zouma more, holding them down and allowing Walcott and Ozil more space. Hiddink’s decision to field Mikel, Matic and Fabregas proved pivotal to the match. Each played a different and complimentary role, that allowed Chelsea to remain solid defensively and dynamic going forward. Mikel and Matic both sat in front of the back four, covering the gaps and helping to stop Arsenal’s counters. Mikel was decidedly the more defensive of the two, while Matic did often press higher up the field and looked to contribute offensively. Fabregas, meanwhile, did not sit in the no. 10 spot that he was slotted in. He drifted around the field, taking up a free role. Since he didn’t have to at least try to get back and defend, Fabregas was free to keep possession in Arsenal’s final third, make runs into their box, and drop deep, even between the center backs, to get the ball. In each of the photos above, Cesc is out of possession, and drops down between Matic and Mikel to get the ball. While he often roams freely like this, Chelsea normally suffer the consequences of missing a midfielder on defense. But with Mikel and Matic both sitting in front of the back four, the defense remained safe. Here Fabregas picks up the ball of Walcott, and then starts a Chelsea counter. He makes a great run in the half space, and creates a good chance. Once again, he isn’t missed in the midfield, with both Matic and Mikel covering. Chelsea’s main attacking strategy was to send Diego Costa on runs into the half spaces, primarily Mertesacker’s, and play through balls to him. It was a very successful strategy, particularly in the 17 minutes that Mertesacker was on. Mertesacker didn’t have the pace or physicality to run with Costa, and Arsenal’s high line meant Mertesacker was forced into defending Costa on the run. Here is the play that sent Mertesacker off. Willian picks the ball up the ball deep and for some reason runs through the middle of the field unchallenged. He then picks out a beautiful pass to Costa, making a run, inside to out, in the half space. Mertesacker, who foolishly tried to play an offside trap/step out on Willian, is left behind, and with Koscielny trailing as well, is forced into making a stupid challenge. It was clear that Chelsea were targeting Mertesacker’s lack of pace, just as Arsenal targeted Ivanovic on the left. But whereas Mikel was able to help Ivanovic, Arsenal’s defensive midfielders, primarily Mathieu Flamini, were nowhere to be seen. In the above photos, Flamini and Ramsey (in all fairness, not really playing as a defensive midfielder after Mertesacker’s red card) are nearly at midfield, pressing the ball. Which wouldn’t be a problem if the backline was doing the same. But they aren’t, and Fabregas gets around Joel Campbell easily, with the ball at his feet and 20 yards of room to work in. The easiest way to get Fabregas off his game, and to negate his offense, is to press him, hound him, and force him to give up possession. When he doesn’t have the ball, he can’t dominate play. Arsenal did none of these things, and Fabregas made them pay, time after time, with his pinpoint passes. Arsenal will be supremely disappointed with this result. Although they can complain that the Mertesacker red was harsh (it wasn’t) they must face the realization that they lost at home to a Chelsea side that are, however unlikely, nearer to relegation then they are to Europe. Wenger’s tactics weren’t awful to start, but he failed to good adjustments after Mertesacker’s red. Chelsea, on the other hand, were very happy with the 1-0 win, in a game that many Chelsea fans had thought could be a rout. But it was, in reality, an average performance. Although they were defensively solid and creative on offense, these were in relation to the rest of the abysmal season. Chelsea were up a man for most of the game, and only managed to score once, and created few chances beyond that. It was a step in the right direction for the Blues, but it should be clear this wasn’t a perfect performance.